Published on February 25, 2009 in Other Beers. 4 Comments Tags: brewery, oakshire, tour. Ella and I were down in Eugene last Friday and were lucky enough to get a private tour of Oakshire Brewery from the head brewer, uncle Joe. The brewery is located in a light industrial area next to the train yard, which Ella pointed out over and over. 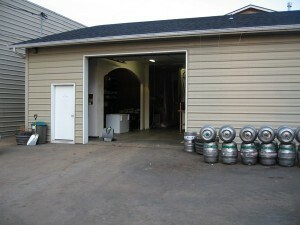 The only clue that it was a brewery was the stack of kegs in front, otherwise, it looked like the other surrounding businesses. When we arrived, it was shortly before closing on Friday night. The garage door was open and a fellow my age was mopping the floor to clean up dirt that had been tracked in by a bobcat moving through the brewery to what would become the cellar. 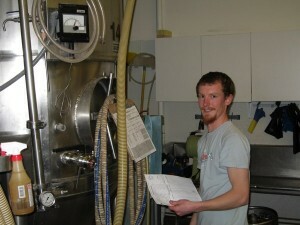 The man, Chris Althouse, happens to be one of the founders putting in his time at his brewery. Joe poured me a sample of the wheat and Ella and I watched and explored as he finished up work for the day. The wheat (beer) is filtered, and has all the trappings of a summer beer; clean, bready and refreshing. Though filtered, it doesn’t lose the interest you might expect. The brewery is about to change, but the current configuration is a single mash/lauter tun, single kettle, 4 fermenters, 1 bright tank and a cooler for cellaring. I’ve forgotten the volumes of each, though I’d guess the fermenters are ~20BBL and the kettle is under 10BBL. Hopefully Joe can correct me on these. Joe poured me a sample of the Amber, which surprised me at first. I’ve grown accustomed to hoppy or sweet (and frankly boring) ambers and this is a departure from that. It’s delicious though – toasty and malty and just enough roast to remind you of a Scottish. I’d really like to try it again, so hopefully I can figure out where Point Blank distributes the beers here in Portland. The brewery has remnants of the proprietors’ home brew days. 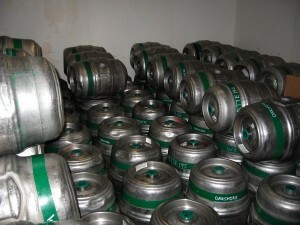 Old Sankey keg conversions have been repurposed for cleaning and sanitizing. 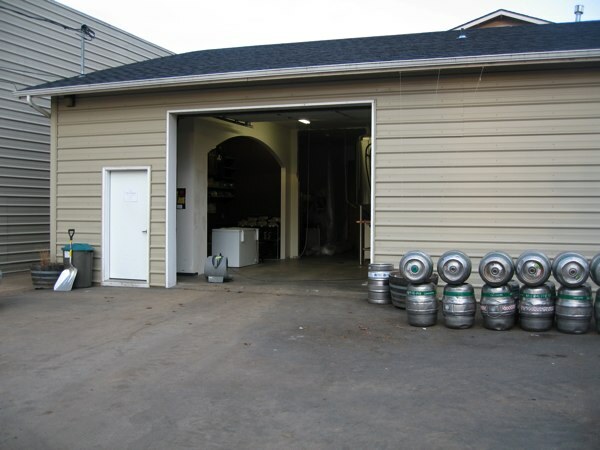 As we talk about the various equipment, Chris mentions which parts they hope to upgrade soon and it is clear that a lot of thought has gone in to the brewery and to the direction they’d like to take it. Next I tried the IPA, a beer I’d sampled at a festival in the past. It has a malt body that’s a little more old world, but the hops clearly have a northwest pedigree. The hop bill might change given the market, but if my memory is correct, it’s Centennial and Cascade for the aromatics and some Amarillo and Simcoe for dry hop. I want to say that Chinook was the bittering for all the beers, but it may have been Columbus. The IPA is a solid beer which Joe is happy about, comparing it to the IPA from some of his past jobs. I agree with him – it’s very drinkable and is a mouthful of the things I like in an IPA. The last sample is of the coffee stout which Joe draws off the bright tank. 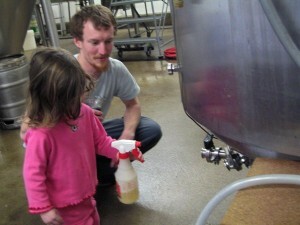 Ella helps him sanitize the outlet afterwards, keeping the beer safe. It hasn’t fully carbonated yet, but that isn’t a detriment to the beer. I remember this beer fondly from a past festival. Cold-pressed coffee and chocolaty roasted barley make for a smooth and delicious beer. Despite being winter, I’ve had a limited intake of stouts this season, but this one is great. There’s no harsh bitterness from the coffee. I really recommend finding this one on tap somewhere soon. While finishing this last sample, Jeff, the other co-founder shows up and the two brothers catch up on the construction progress, the plans for the weekend, and sample some of the IPA. It’s clear from their mood and from the beers themselves that things are going well and that the future is promising. Joe is an excellent addition to the brewery and I expect he’ll only help make things better. He brings a wealth of knowledge and experience as well as a calm demeanor and strong set of problem solving skills that are necessary in the brewhouse. Since I’m a friend of his, take from these comments what you will, but I think you’ll find the proof in the puddin’. Oooh… tapioca beer. That’d be like petrified carbonation. I’m going to call dibs on that, even though it’s sounding less and less appetizing as I think about it.